Animals Sitting Pretty is a unique, professional mobile animal grooming and pet sitting business which COMES TO YOUR HOME. Established by Laura Jones, a professional and qualified groomer and pet sitter - with lots of experience and care. We serve Cwmbran, Newport, Pontypool, Blackwood, and the surrounding areas. Animals Sitting Pretty enables people with busy life schedules, without a car or who are house bound to have their pets groomed outside the comfort of their own home. 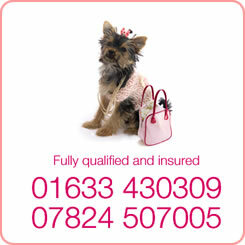 We are fully pet insured, and will treat your animal with the utmost care and respect. Pet sitting and pet visits, dog walking and grooming for small animals is also available. Remember WE COME TO YOU! We are pleased to annouce that as well as the excellent service offered with the mobile dog grooming van , Animals Sitting Pretty has now opened a brand new salon , where now you can book an appointment and YOU CAN NOW COME TO US. Please take a look around our web site to see our ‘state of the art’ mobile dog grooming van and checkout our 'new salon ' based in Caerleon. Call today to arrange an appointment that is right for you - at the salon or visit from the van.